The median home price in San Francisco is $749,000, so being able to buy anything new at a third of that price is noteworthy, especially if it’s in one of the most desirable neighborhoods in the city. – Sofa-bed, and a wardrobe with no closets. The city government played a huge role in allowing the condos to be classified as SROs (single-room occupancy), in that they weren’t treated like standard residences. What’s the big deal? Limited parking requirements and relaxed restrictions on the total number of units – two fundamental elements of building attainably-priced housing. That’s a big deal indeed. 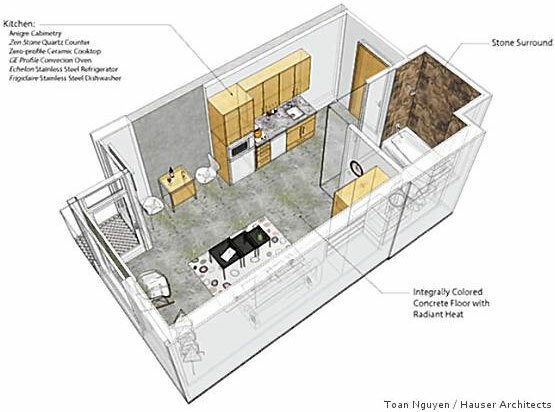 Read more in the SF Chronicle article, Home small home: 250 square feet in SoMa.